What makes a car intelligent? More than just electronics. In due time parts became smaller and materials stronger. That's why Mercedes-Benz could create more space inside the same exterior dimensions. Therefore, it all starts with an intelligent design. And it shows in the boot! It now measures 640 litres. At the moment of writing that makes the E-Class Estate the most spacious car in its class. Very smart: the backrest of the rear seat can be adjusted in several steps to create up to 30 litres of extra storage without folding the back seat. Using buttons in the boot the rear seat can be folded in uneven parts to reach the maximum capacity of 1,820 litres; again the biggest in the segment. This makes the E-Class Estate a real workhorse and much more than just a "lifestyle" vehicle that's chosen for its looks alone. Also, the loading floor is perfectly flat. Mercedes-Benz supplies the necessary accessories to split the space into compartments and there's a "hidden" space underneath the floor that's big enough for a whole shopping bag. 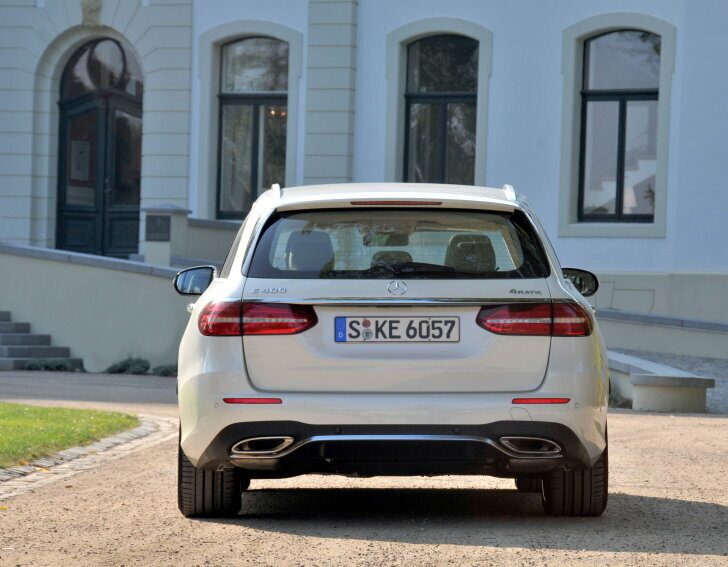 Of course, the E-Class Estate comes with a power tailgate. 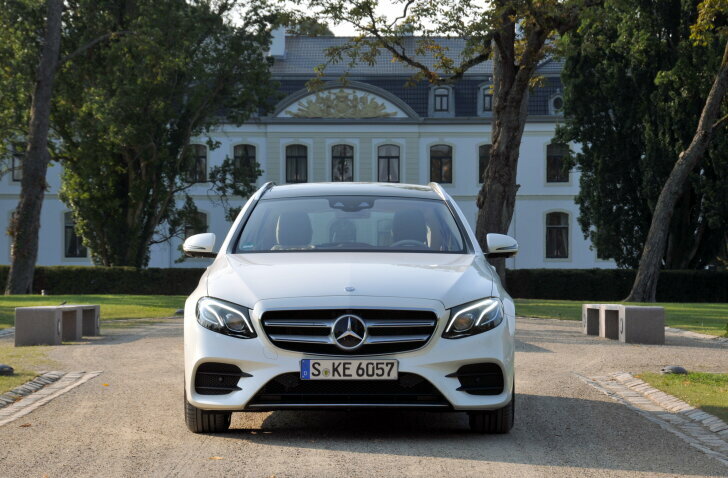 In the front, the E-Class Estate is equal to the sedan. That means plenty of headroom and legroom, but no more than usual for a car of this size. This working man's E-Class is luscious and luxurious, in a style that combines the classic Mercedes elements with modern technology. The light tints in the cabin of the test car give the occupants the privileged feeling of being in a special car even before setting off. That feeling is enriched by the huge display which extends from behind the steering wheel to the middle of the dashboard. Behind the steering wheel essential information for the driver is shown (speedometer, rev counter). On the central part of the display the infotainment system (audio, satnav, bluetooth) is shown. Sometimes the satnav is too slow when instructions follow in rapid succession, which means the driver misses out of exits. Optionally the key can be replaced by a smartphone with NFC (near field communication) and a bespoke Mercedes-Benz app. During the test drive this didn't work too well because the phone has to stay exactly in its dedicated slot. When accelerating fiercely or cornering quickly, the phone will move and immediately a warning appears saying the key isn't recognised. Also: the smartphone solution hardly offers any advantages over keyless entry. The audio system deserves a special note, because when opting for loudspeakers and amplifiers by "Burmester" the sound quality is absolutely immaculate. It's the many safety features that make the E-Class truly unique, or rather: intelligent. The E-Class takes this one step further than the now usual cameras and sensors that merely look ahead and warn when necessary. The E-Class can actually drive itself! By engaging the "Drive Pilot" the computer will take over the throttle, brakes and steering. In theory this would enable the E-Class to cover long distances all by itself, but this isn't allowed by law (yet). That's why after some 10 seconds a message appears to encourage the driver to take control again. The E-Class can even assist when overtaking other cars: by simply touching the indicator lever for several seconds the computer will check for space on the other lane, after which it will pass the slower vehicle. During an earlier test drive with the E-Class sedan in The Netherlands, the Drive Pilot wasn't convincing because it broke several traffic regulations and misinterpreted road signs. During this drive on the more quiet roads in the north of Germany, the auto pilot performed flawlessly. Another contrast with the Dutch test drive: that time the base petrol and diesel engines were tried. For this second test a true powerhouse was used: the E400. This means a 333 PS / 480 Nm strong six-cylinder engine. To make sure this power can be converted into traction under all circumstances "4Matic" (four-wheel drive) comes as standard. Strictly speaking the E400 isn't the fastest E-Class, that role goes to the sportier AMG models. The E400 uses its power to offer the utmost comfort. The engine is hardly audible (nor are sounds from the wind or tyres) and doesn't show a trace of aggression. When the pedal is put to the metal a higher speed simply appears, without ever experiencing any acceleration or violence. On the German Autobahn 175 km/h is mere walking pace. Of course this superiority comes at a price: the E400 is thirsty for petrol. Expect about 10 litres per 100 km in real life. The nine-speed automatic gearbox ("9G Tronic") works well, but it is slightly noticeable when it shifts, and with a car like this it should be unnoticeable. The E-Class Estate has the same wheelbase as the sedan and the difference in weight is minimal. That's why both cars handle the same. That means that driving fast or sporty is possible, preferably after activating the sports mode (adjusted springs, steering and more). In that case, grip levels are excellent and with only one hand at the wheel the driver can effortlessly outperform most other traffic. However, that's not what the E-Class is meant for. The E-Class is at its best when driving calmly and fluently. Only then one notices how beautifully the car "rolls" and how the gearbox ratios perfectly fit the characteristics of the engine. 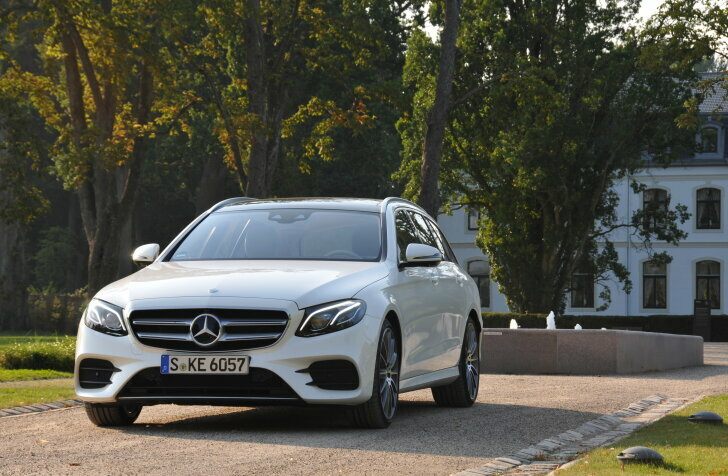 After the new E-Class sedan, Mercedes-Benz now introduces the new E-Class Estate. The sedan has already distinguished itself with smart electronics and so does this estate. Integration with smartphones, plenty of safety features and an automatic pilot make daily life with the E-Class more safe and more comfortable. The E-Class is a true Mercedes-Benz, which means that driving dynamically certainly is possible, but emphasis is on comfort. The E400 driven here excels in comfort and superiority. For the Estate the intelligence goes one step further by smart design. The new E-Class Estate is roughly the same size as its rivals, but still manages to offer lots more space. 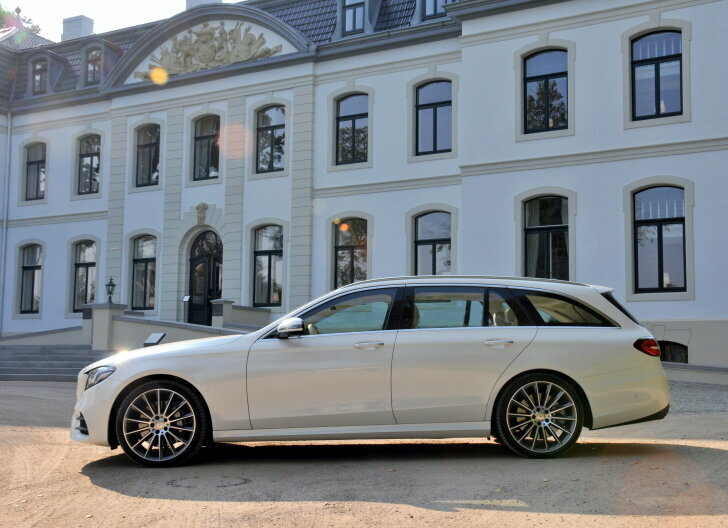 In other words: the E-Class Estate offers beauty and brains.